The FPS Warriors 2 Bundle offers eight different kinds of virtual violence for less than you'd pay for a decent burger. 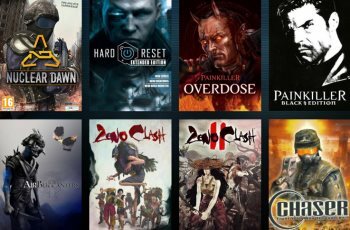 There are an awful lot of game bundles floating around these days, most of which go overlooked because, to be brutally honest, they're just not terribly interesting. The FPS Warriors 2 Bundle from Bundle Stars, however, is one that I think deserves some attention. For four bucks you get eight games, beginning with Nuclear Dawn, which I've heard is not terrible, AirBuccaneers, which looks kind of cool, Chaser, which to be perfectly honest looks kind of crappy, and Painkiller: Overdose, one of the many proofs that it is impossible to make a decent Painkiller sequel. But then things get interesting. You get Zeno Clash and Zeno Clash 2, the quirky-but-cool first-person brawlers set in a primitive and very bizarre fantasy world. There's Hard Reset: Extended Edition, an old-fashioned high-intensity shooter with a great visual aesthetic. And then topping it all off is Painkilller Black, the gussied-up re-release of the original Painkiller that includes the Battle Out of Hell expansion, and that may well be the best pure shooter of the past decade. Not bad, eh? It's a very subjective opinion in this era of cheap, cheap games, but there's no question in my mind that any one of those latter four games is worth the price of admission. If you've somehow managed to miss out on them until now, this might not be a bad way to rectify the situation. The FPS Warriors Bundle 2 is live now and will remain on sale until February 26.